Senior Emma Coburn currently leads the state in rebounds and steals per game. Junior Emma Vosburg is one of the top five scorers in the state. Obviously, they are a large part of why the Lady Titans basketball team is 14-2 thus far and in the hunt for another Mountain League title. Yet, in the past several weeks, a supporting cast of players has stepped up and could be the difference in the team’s success come the post season. Players such as juniors Jessie Frame and Allie McFarland are bringing key offense underneath and solid work on the boards. In addition, coach MaryMike Haley has juniors Kaitlin Councilman and MacKenzie Mailly healthy and getting significant playing time and sophomore Sydney Loyed stepping up and scoring key baskets when defenses key on Vosburg up top. 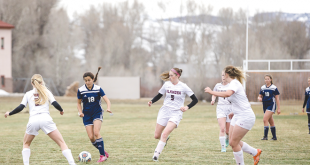 The first half of the Lady Titans win over the Creede Miners was a prime example of the team’s development. Vosburg opened the game with a lay-up on an assist from Frame. McFarland hustled back on defense to force a turnover and then hit an eight-foot jumper for two of her five points in the half. Coburn scored seven of her 19 points in the first half, Mailly and Councilman each scored and when Creede jumped on Vosburg, Loyed drove to the hoop to score, sparking a seven-point rally giving the Lady Titans a 26-14 lead at halftime. Vosburg went on to lead the team with 20 points and Coburn pulled down 28 rebounds as the Lady Titans finished with a healthy 57-25 win. 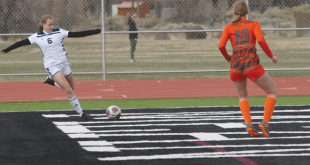 The Lady Titans returned to league play on Saturday playing host to the Vail Christian Saints. The game’s start was almost a carbon copy of the game the day before as Frame fed Vosburg inside for the Lady Titans opening bucket. Mailly knocked down two short jumpers in the first quarter and Vosburg ended the quarter scoring in traffic to give the Lady Titans a 17-2 lead. The Lady Titans held Vail Christian to two points in the second quarter as well, building a 25-4 lead by halftime. Vosburg led the team in scoring with 17 points, Coburn had nine points and 13 rebounds and Frame followed close behind scoring eight points as the Lady Titans won 49-12. The Lady Titans end the regular season this weekend as they hit the road to face Ridgway on Friday, February 22 and then play the last game of the regular season at home on Saturday, February 23 against Debeque. Tip-off for Saturday’s game is at 1 p.m. If the Lady Titans win both games this weekend they finish with a perfect league record of 8-0 for the second year in a row and the Mountain League title.